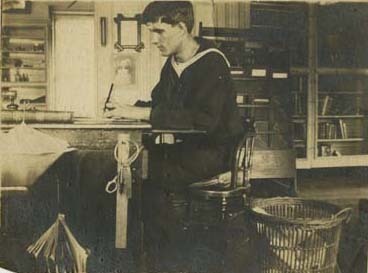 A Navy editor, possibly Charles Johnson Braden, sits at his desk in a library at an unknown location. Braden served in the United States Navy from 1902 until his death from tuberculosis in 1908. He was the creator of the magazine, Our Naval Electricians, and was an avid amateur photographer during his extensive tour. “Navy Editor,” Chronicling Illinois, accessed April 25, 2019, http://chroniclingillinois.org/items/show/13449.